Operating system deployment in Configuration Manager is driven by Task Sequences. The HP ProLiant Server OS Deployment kit comes with a sample task sequence template and can be used either by creating a new task sequence or adding on to an existing task sequence. From the console, open Computer Management>Operating System Deployment>Task Sequence. Right-click the node, select Bare Metal Server Deployment>Create a HP ProLiant Server OS Deployment Template. You can also access the Create a HP ProLiant Server OS Deployment Template from the Actions panel. Fill in the content for the Create Server Deployment Task Sequence window. Select Set Boot Order, Set BIOS config, Set RAID config (either ini file or wizard) and Set iLO config for normal deployment process. Click Create. Record the created task sequence name, and click Close. Edit the existing task sequence, click Add, and then select HP Deployment>HP ProLiant Server OS Deployment. At the pop-up window, click Yes. Read the content of the Potential WinPE Issues window, and then click OK. Fill in the content for the Create Server Deployment Task Sequence window. For normal deployment process, select Set Boot Order, Set BIOS config, Set RAID config (either ini file or wizard), and Set iLO config. Click Create. Note the created task sequence name, and then click Close. To close the Task Sequence Editor of the original task sequence, click Cancel and Yes. 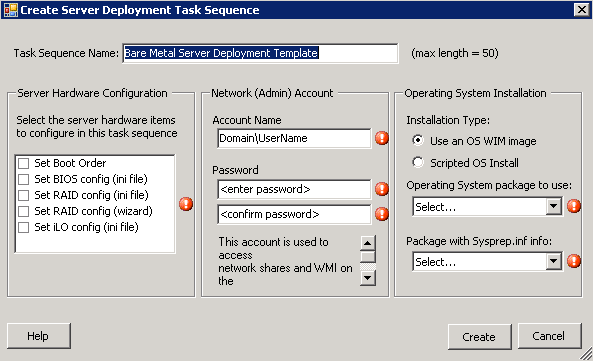 The original task sequence is copied to the generated task sequence and added with the ProLiant deployment tasks. NOTE: The generated HP ProLiant Server OS Deployment task sequence is only a template and requires customized settings to function properly. 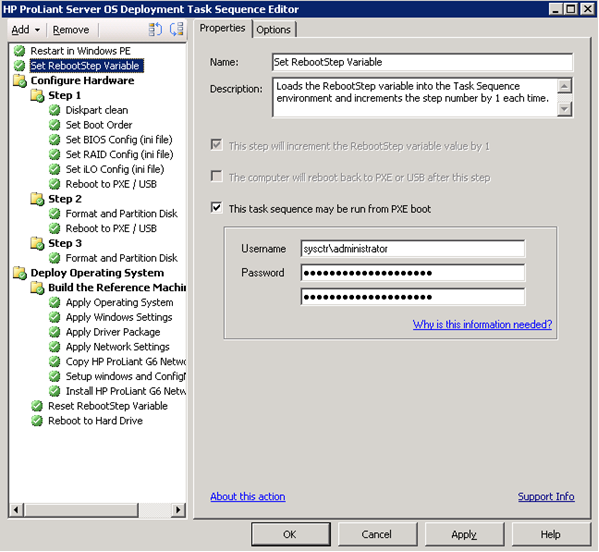 The default task sequence template uses x86 WinPE boot image and drivers package from the HP ProLiant Drivers for Windows Server® 2008 (x86). The generated HP ProLiant deployment task sequence contains tasks to configure BIOS settings, storage array, and HP iLO setting. HP recommends that you update and review these tasks. The HP ProLiant Server OS Deployment kit also comes with a number of sample configuration files for each setting. Select and update the configuration files into distribution points appropriately before advertising to the client server. For details on editing the configuration files, see the HP SmartStart Scripting Toolkit Windows Edition User Guide. NOTE: The HP ProLiant Server OS Deployment task sequence templates contain tasks such as Set RebootStep Variable and Reboot to PXE/USB to reboot server and track deployment progress. The grouping and order of the sample task sequence is important. Do not delete any groups or remove any of these tasks. Do not modify the conditions set on the groups. This might cause the task sequence to malfunction. Open the Properties>Advanced page of the newly created task sequence and ensure that the selected boot image is appropriate. The created task sequence uses HP ProLiant Server OS Deployment SSTK Boot Image (x86) by default. Select HP ProLiant Server OS Deployment SSTK Boot Image (x64) if the x64 version of the operating system is deployed. 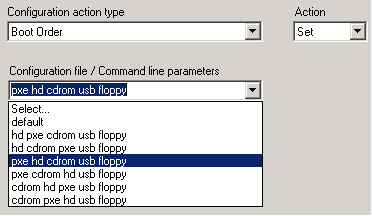 WinPE automatically picks and runs the correct version of the HP SmartStart Scripting Tools. To close the Properties window, click OK.
To open the Task Sequence Editor, right-click the task sequence, and select Edit. Select the Set Boot Order node, and then select the appropriate boot order from the Configuration file / Command line parameters menu. Select the Set BIOS Config (ini file) node and select the appropriate configuration file from the Configuration file / Command line parameters menu. You can also click the View button to view or edit the configuration file. Select the Set RAID Config node. For Set RAID Config (ini file), select the appropriate configuration file from the Configuration file / Command line parameters menu. You can also click the View button to view or edit the configuration file. Select the Set iLO Config (ini file) node and select the appropriate configuration file from the Configuration file / Command line parameters menu. You can also click the View button to view or edit the configuration file. You must put the credential information into the configuration to authenticate access to the management processor. Disable the Copy HP ProLiant G6 Network Driver and Install HP ProLiant G6 Network Driver tasks if you are not deploying Windows Server® 2008 operating system. Review and update all the remaining tasks in the task sequence. NOTE: You must manually update the distribution point if the configuration file is added or modified. Review the References in the bottom center panel of the Configuration Manager console for the task sequence to ensure that all referenced packages have been properly updated to the distribution point. The task sequence fails if any of the referenced package is not available.